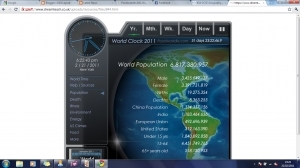 This presentation gives a visual representation about the speed of population growth. 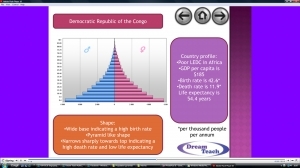 This presentation shows the function of population pyramids. It looks at a variety of examples and shows how the shape of the pyramids can vary for a range of scenarios. This presentation demostrates the demographic transtion model. 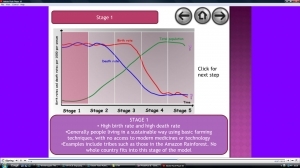 It takes a look at each stage in depth outlining the birth rates and death rates and the reasons for them. 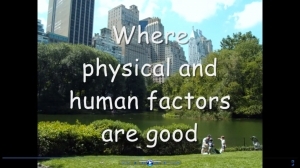 This presentation focusses on where people around the world live and the physical and human reasons why. 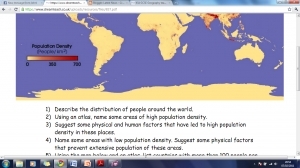 This presentation compares population distribution in the UK, USA and Australia. This worksheet accompanies the 3a) Population distribution- reasons presentation. This is a colour version. This worksheet accompanies the 3a) Population distribution- reasons presentation. This is a black and white version. 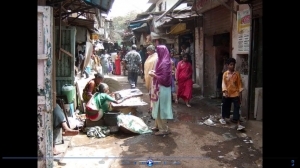 This presentation looks at the difference in approach to population problems by the two population heavyweights, China and India. 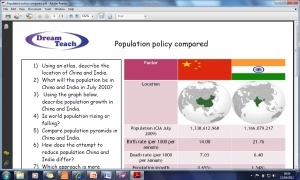 This worksheet is designed to accompany the population policy compared worksheet. 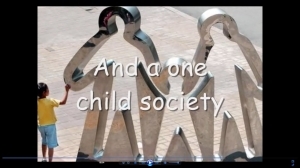 This movie focusses on population problems in both MEDCs and LEDCs. It discusses the problems of ageing population and declining population is some areas within MEDCs and the problem of growing population in LEDCs. This movie demonstrates the drastic approach taken by the Chinese government in response to a rapidly growing population. It looks at all aspects of the policy from its enforcement to its after effectts. This movie demonstrates India's very different approach to managing their increasing population. 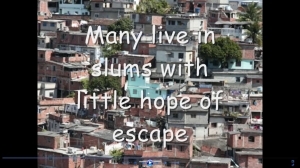 It looks at the strategies employed and reflects upon whether they are successful enough.